CAMARILLO, Calif., Apr. 12, 2018 – Semtech Corporation (Nasdaq: SMTC), a leading supplier of high performance analog and mixed signal semiconductors and advanced algorithms, announced its new next-generation LinkCharge® LP (low power) wireless charging platform. The new platform combines the receiver and battery charger in a single IC making it ideal for very small footprint applications, including wearable devices, tablet keyboards and LoRa®-based sensors. The new IC is a 2.3 mm x 2.3 mm full-integrated wireless receiver with an integrated a Li-Ion or Li-Polymer battery charger. The LinkCharge LP wireless charging platform provides a system rail pin with a switch to charge the battery and power the system at the same time. The wireless charger provides up to 250mA of charging current and is designed to work with Semtech’s evaluation module (EVM). In addition, LinkCharge LP is able to charge multiple LoRa-based sensors with no connected wires. 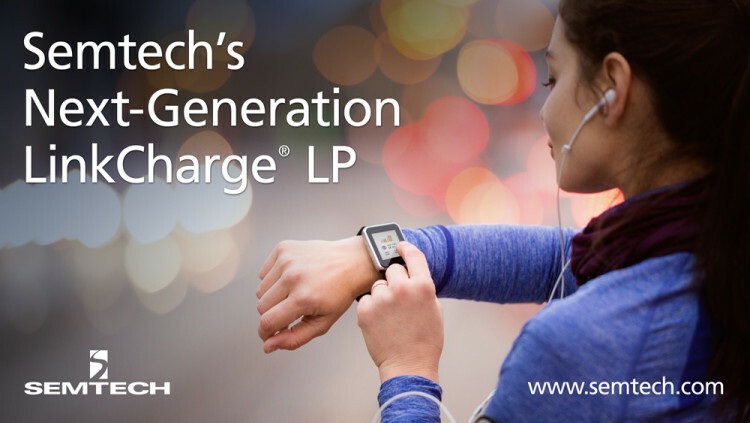 LinkCharge LP is immediately available through Semtech. The datasheet for the EVM is available on www.semtech.com. Learn more about Semtech Wireless Charging Technology and how LoRa Technology enables IoT. Engage with the LoRa Community, a platform for thousands of IoT and M2M technologists, developers, end users, and solution providers, to access exclusive content. Enter your products in the LoRa Catalog to showcase your IoT solution. Join the LoRa Alliance, one of the fastest growing Internet of Things (IoT) alliances with over 500 members. Follow Semtech on Twitter, LinkedIn, Facebook, YouTube, and Google+. Semtech’s LinkCharge wireless charging platform provides a range of solutions to enable wireless power in next-generation products for consumers, infrastructure and industrial applications. It includes the LinkCharge 40 Series, the LinkCharge 20 Series, the LinkCharge CT series, and the LinkCharge LP. The LinkCharge platform is compatible with the major industry standards ensuring end products can quickly charge any wireless charging-equipped device even as the industry adoption continues to grow and evolve. More information about LinkCharge platform and the rest of Semtech’s wireless charging solutions is available at www.semtech.com/wireless-charging. All statements contained herein that are not statements of historical fact, including statements that use the words “ideal for,” “designed to,” or other similar words or expressions, that describe Semtech Corporation’s or its management’s future plans, objectives or goals are “forward-looking statements” and are made pursuant to the Safe-Harbor provisions of the Private Securities Litigation Reform Act of 1995, as amended. Such forward-looking statements involve known and unknown risks, uncertainties and other factors that could cause the actual results of Semtech Corporation to be materially different from the historical results and/or from any future results or outcomes expressed or implied by such forward-looking statements. Such factors are further addressed in Semtech Corporation’s annual and quarterly reports, and in other documents or reports, filed with the Securities and Exchange Commission (www.sec.gov) including, without limitation, information under the captions “Management’s Discussion and Analysis of Financial Condition and Results of Operations” and “Risk Factors.” Semtech Corporation assumes no obligation to update any forward-looking statements in order to reflect events or circumstances that may arise after the date of this release, except as required by law. Semtech, the Semtech logo, LinkCharge, and LoRa are registered trademarks or service marks of Semtech Corporation or its affiliates.